By looking at city transport costs, average waiting time and commute time by car, train, or bus, hours in congestion, etc. to determine the cities with the worst commutes. Soaring costs, delays, and bumpy rides are just some of the hardships endured by commuters daily. The situation is so dire that people are quitting their jobs because of poor transport system or spending more than they should. A recent study was conducted to determine the quality of the transport system in 74 cities across the world and the challenges faced by commuters in these cities. The study accounted for the average time spent commuting daily; the time spent waiting for a train or bus, the time it takes to complete a one-way journey, and the percentage of travelers who have to at least board another mode of transport to complete a single journey. The survey also accounted for the average transport cost as a percentage of the monthly salary and the average number of hours spent in the traffic jam over 240 days. A score is assigned to each of these factors and weighted. The city with the lowest score is considered the best in public transport system while the city with the highest score has the worst transport system. 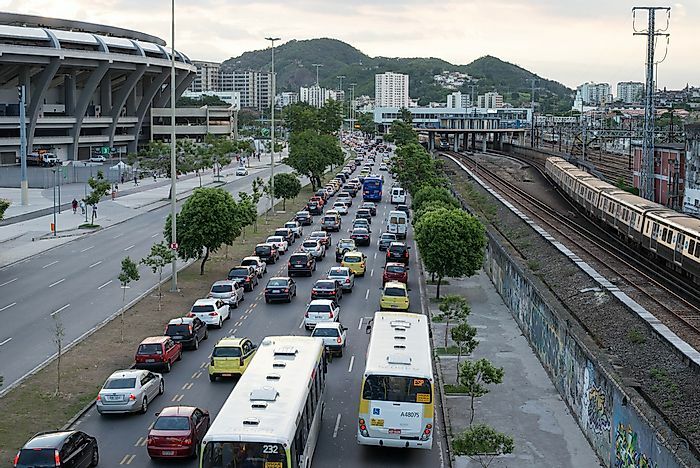 Rio de Janeiro has the worst public transport service of the 74 cities. Rio amassed a score of 86.26. Although the city has seven transit modes including: light rail, metro, train, bus, ferry, gondola, and funicular. A metropolitan population of about 13 million people is just too much for the city to serve efficiently. It takes an average of 19 minutes to board public transport and 95 minutes to journey to and from work. However, 32% of those who use the public system spend more than 2 hours on the road while 35% have to wait for more than 20 minutes to board. Congestion and poor infrastructure are the main reason for the inefficiency. Bogota, Colombia also has an inefficient public transport system. There are three modes of public transport in Bogota; SITP, Transmilenio, and funicular. However, the city’s metropolitan population of 10.2 million overwhelms available transport rendering the service inefficient. Poor road network, congestion, and a large number of vehicles on the road compound the problem. On average, it takes 20 minutes to board a public transport and 97 minute travel to and from work. However, 40% of the commuters have to wait for more than 20 minutes while 32% spend more than 2 hours commuting. São Paulo faces the same problems as Rio de Janeiro and Bogotá. There are three transit modes including metro, train, and bus. However, Sao Paulo has a metropolitan population of about 21 million that piles pressure on the public transport system and the existing infrastructure. On average, it takes 19 minutes to board public transport and 93 minutes to commute to and from work. Nice, Cuenca, and Bilbao in France, Ecuador, and Spain respectively have the best public transport system in order. Smaller population in these cities have contributed significantly to the efficiency in the public transport system. Good Infrastructure and alternative public transport modes have also contributed to the efficiency. An efficient public transport system means that commuters spend less time waiting for the buses or trains and spend less.